The beautiful Dolphin Bay Cottage is centrally located to many of the best island attractions. Best of all, it is situated only 300 feet from enchanting Kealakekua Bay. You may check available dates for Dolphin Bay Cottage using the calendar to the right. For an instant quote fill in your dates and number of guests in the form. Have a question? We’d love to hear from you. A lovely, air conditioned, private 1-bedroom cottage nestled near the famed Kealakekua Bay, a Marine Sanctuary in South Kona. This cottage was fully renovated in November 2015, is beautifully furnished in tropical style, and is appointed with everything you need for your stay. Dolphin Bay Cottage accommodates 1-2 guests and can be rented separately or in conjunction with Dolphin Bay House. It is situated only 300 feet from the famed Kealakekua Bay where you can swim in the crystal clear waters and enjoy some of the world’s best snorkeling, swimming and kayaking. Kealakekua Bay is home to pods of Hawaiian spinner dolphins, turtles and other amazing marine life. Marvel at the dolphins and whales (in season). Admire the graceful green sea turtles and go nose to nose with a rainbow of exotic fish. The bedroom has a king bed with comfortable and inviting tropical decor. There is a full bath with shower and tub. A fully equipped kitchen with filtered drinking water, full size fridge, new stove with oven, dishwasher, new microwave, coffeemaker and grinder and all utensils you’ll need for cooking. Also included are air conditioning, all linens, beach towels, wireless Internet, cable TV, gas BBQ, beach chairs, cooler and washer/dryer. The cottage has its own driveway and entrance. The cottage is surrounded by beautiful tropical landscaping and is immaculate inside and out.
. We welcome you to come enjoy our little corner of paradise and the crystal clear waters of the Bay . . . practically at your doorstep. The Dolphin Bay cottage was perfect for us. The bed is large and comfortable, and the kitchen very well equipped. We found everything we needed for cooking our own meals. We loved being so close to Manini Beach. The snorkeling was surprisingly good, and we could walk "home" for lunch. Wè will definitely book the Dolphin Bay Cottage again! Stayed Sep 2018, Tracy P.
Beautiful little cottage with everything we needed. Overseer was very sweet and made sure we had everything we needed. Beach is unbelievable!! Didnt want to leave. We bought fresh fish from a local and cooked at cottage. So good! Love love love! Will return! Stayed May 2018, Sarah E.
This was the perfect place for my husband and I to stay while on the west side of the island. We prefer quiet and nature over the tourist hub of Kialua and the resorts. This sweet cottage is mere steps away from the boat launch, where you can rent kayaks, and Manini Beach, across the bay from the Captain Cook Monument. The cottage has everything we needed, including washer dryer and dishwasher. We can’t wait to return to Dolphin Bay Cottage. Dolphin Bay Cottage is the perfect place for a couple to stay in the Captain Cook/Kealakekua Bay/Manini Beach area. The bay is just steps away, and you can sit by the bay and watch beautiful sunsets, or rent a kayak and paddle and snorkel with pods of dolphins. The cottage itself is adorable, comfortable and very well equipped. We can't wait to return. The Dolphin Bay cottage was very well equipped with all the utensils we needed for cooking our own meals. The large bed was super comfortable and the neighbourhood quiet for sleeping. We loved being so close to Manini Beach.. it meant we didn't need to use our car except for visiting 2 Step beach. Both 2 Step and Manini beaches had great snorkelling. We will definitely book the Dolphin Bay cottage again! Dolphin Bay Cottage was the perfect get-away spot for my our vacation. Perfectly sized for two people, with everything we wanted right at or fingertips. The layout of the cottage is excellent and the decor was lovely. Plus, it is the only rental house we have stayed in that has had sharp knives, making cutting all the wonderful fresh fruits and vegetables a breeze. Everyone was very friendly, and the rental process was straightforward, All in all, it exceeded our expectations. We truly enjoyed our one week stay at the cottage. We had an awesome time, absolutely loved the secluded location and proximity to Manini Beach park, the bay, and excellent snorkeling, and found the cottage comfortable for our needs. The owners and their local liaison were incredibly helpful and accommodating. My wife and I can definite see returning to cottage and are already looking forward to our next trip. Charming, modern, clean and comfortable cottage located steps from Mannini Beach on Kealakekua Bay. Tranquil spot surrounded by beautiful gardens. This cottage is perfect for two persons. It is well appointed with everything that you will need. Good support from property management. Close to all South Island sights, including kayaking to Captain Cook monument and snorkeling. I kind of hate to leave the glowing review the Dolphin Bay Cottage deserves, as it will just make more competition when we want to return. If you are looking for a place away from the crowds, in a beautiful setting with the ocean just a block away, this is it. The cottage itself is very nice - well maintained, plenty large for two us, and a beautiful yard. It could be the best place we have ever stayed. It had everything we needed, and then some (meaning we didn't cook there, but we could have). The bed was really comfortable, the freezer worked great (I go through a lot of ice), and little extras made available to us made for a great experience. Martha and Krista both provided quick responses to questions, and many helpful suggestions for groceries, restaurants, etc. Manini Beach is a block away, and it is delightful - grass, palm trees, a great view of the bay, and it was never crowded. Really nice to be able to just walk there and not have to worry about parking. The only disappointment was that our vacation was over much to soon. We would definitely stay here again! Thank you Martha & Leonard for sharing your lovely cottage with us! We truly appreciated our stay and all the help from Krista, the caretaker. The cottage was lovely and beautifully decorated. Additionally, we were thrilled that the kitchen was fully stocked with essentials to prepare meals; and we really used the cooler bag during our day trips for lunches. The town and locals were charming and very friendly and helpful. We will definitely be back for another visit! This is going to be a brief review because it's 5 stars all around! We were there for a week and can't think of any suggestions for improvement. It's a 2-minute walk to Manini Beach, which is a friendly grassy beach. The cottage was cozy and roomy. We had everything we needed. And for the first time ever, we found a rental with sharp knives! Thanks Martha, Leonard, and Krista. My husband and I stayed here for our 20th anniversary. We loved the location. Just a little over an hour drive to Volcanoes National Park, 30 minutes to Kona and the best part was being so close to great snorkeling. If you want to kayak across to Captain Cooks Monument, you are in the best location. We found several hikes nearby and really used the wonderful guidebook they have for guests. The bed was very comfortable, and everything you might need is provided. It is perfect for a couple. The cottage had recently been remodeled so everything feels new and it is beautifully decorated. The yard is filled with wonderful tropical plants and fruit and the beautiful sound of birds. Can't wait to return to Dolphin Bay Cottage. I can't imagine a better place to enjoy the peacefulness of the Big Island. During our stay we did not need to contact the owner or the caretaker because we didn't have any problems. The cottage was clean, airy, nicely furnished, and stocked with just about every incidental item that we forgot to bring. It felt refreshing to sleep with the windows open, to enjoy the breeze and the sound of the sea, to wake up to filtered sunlight through surrounding tropical garden foliage. In the mornings we'd stroll to the beach, enjoy coffee and a leisurely breakfast, pack sandwiches for a day trip of hiking and snorkeling, come home to cook dinner (use of the gas grill was awesome! ), and finally stroll back to the beautiful beach for peaceful sunsets and stargazing. The cottage was perfect for two people. It was comfortable and had everything we needed. Dolphin Bay Cottage was a great place to vacation. We loved being in a quiet neighborhood and so close to Kealakekua Bay and Manini Beach. We'd definitely stay there again. We stayed at Dolphin Bay Cottage for 6 nights and had a lovely time. 1 block walk to the Manini Beach park where we spent most days. We really appreciated how every little thing had been thought of at the cottage. We've rented many places over the years so we can tell when the owner/manager cares about making your stay as comfortable as possible, and the cottage met the highest standard. Some things we appreciated: easy access and good directions for our after-dark arrival; an off-street parking spot; a box fan to move around when needed; a room air conditioner for the nights it was just too warm to get to sleep; folding chairs to carry to the beach (and a Styrofoam cooler); big friendly beach towels in addition to the home towels; an outdoor shower and gear rinsing spigot for snorkel gear; drying racks behind the house for drying off towels or suits; a washer and dryer supplied with eco friendly soap; window screens on every window so we could open everything up to let the breeze in; a small TV with cable (when I HAD to watch the Warriors complete their 73 win season! ); a good wifi connection; a chair on the porch so you can sit outside when it's raining; both DEET and DEET-free bug spray (we didn't need it); non toxic ant spray for the omnipresent minuscule ants that are always finding their way in. A few more positives: We loved the privacy of the location. The house was super clean, neat and everything was in good condition. The garden is beautiful. Very little noise and traffic though the park gets busy sometimes. For food - all in Captain Cook (15-20 mins) we always indulge in some L&L BBQ but we also tried Manago Hotel (good food, and very local clientele), and Teshima's Restaurant. We usually shop about every other day at the ChoiceMart. The only negatives were the teeny ants I mentioned and the living area furniture wasn't super comfortable to spend the day reading on. About the ants: They were impossible to keep out. We kept all food in the refrigerator or in the oven (dry goods etc), and wiped off the counters before and after eating. They aren't in huge numbers like the Argentinean ants we have in California, but persistent and pesky. And they do have a little bite sometimes. About the furniture: very nice pull out love seat and wicker chair, but not terribly comfortable to spend all day reading on. Manini Beach is one of our favorite places to be IN THE WORLD, and this little gem of a cottage is a great place to enjoy it. Mahalo for the time you took to go into such detail about the cottage and your stay. We agree with you about the ant problem but want to let potential guests know we do try to control them. The cottage is sprayed regularly with natural insecticides since we don't want to poison our property or our guests. The tropics are inherently beautiful, but are also inherent to pests like the ants! We also provide a natural spray that can be used inside to help should they show up. Thanks for the great review, we look forward to welcoming you back. We had an amazing stay at Dolphin Bay Cottage, a beautiful home in a beautiful spot. The house is nestled on a sleepy street within eyeshot of the bay. We woke up to birds chirping every morning and swam with the dolphins at daybreak. The owners/caretaker clearly take care of the property and attend to vacationer needs. Mahalo nui loa for your excellent review! We live on the property several months of the year so it is our home and we keep it in the best shape possible. Only steps from Kealakekua Bay and Manini Beach, itʻs an ideal location for our guests to sit back and relax, listen to the morning birds or take coffee and tea at Manini before a swim. We hope to welcome you back in the future. Absolutely everything I can think about was perfect. Place was extra clean, the kitchen was equipped with everything you may need. Wow! When I go back to Hawaii, this is where I'll stay. Mahalo nui loa for your 5-star review! We have the best house cleaners and caretakers who all live locally and take great care of the property. We also live here part of the year so like to hear when our guests have enjoyed it as much as we do when we are here. The cottage has been recently remodeled in 2015 and with the addition of the AC, really makes a vacation with us comfortable. The proximity to some of the best swimming and snorkeling doesn’t hurt either! We hope to welcome you for a future stay! Love the little place. Perfect for 2. Local beach is fabulous for swimming, snorkeling, sunsets, and just hanging out! Absolutely fantastic experience - thank you. So happy you had a fantastic stay at Dolphin Bay Cottage, enjoying the local beach at Manini. Itʻs a special spot and we hope to have you return. Mahalo for your review, it helps potential guests realize itʻs a great place to stay! What a great retreat after a cold winter in Michigan. The wife and I thoroughly enjoyed our stay at the Dolphin Bay Cottage. After being cooped up indoors during the winter it was so nice to be able to sit out on the patio and enjoy the fresh air, smell and sound of the ocean and the serenity of the area. We were able to leave all the windows of the cottage open day and night. The fresh air and sound of the surf sure attributes to a good nights sleep. The cottage is fully equipped with anything you could possibly need during your stay; they have truly thought of everything plus. The cottage itself is very well maintained and meticulously cleaned. Krista, the caretaker, lives just down the street and is willing and available for any issues you may have. We had no issues but had comfort in knowing, if we did, Krista was there to resolve them. We would highly recommend staying at the Dolphin Bay Cottage if your looking for a quite, comfortable retreat away from the hub-bub and congestion of a vacation resort. Would we stay here again? Most certainly. 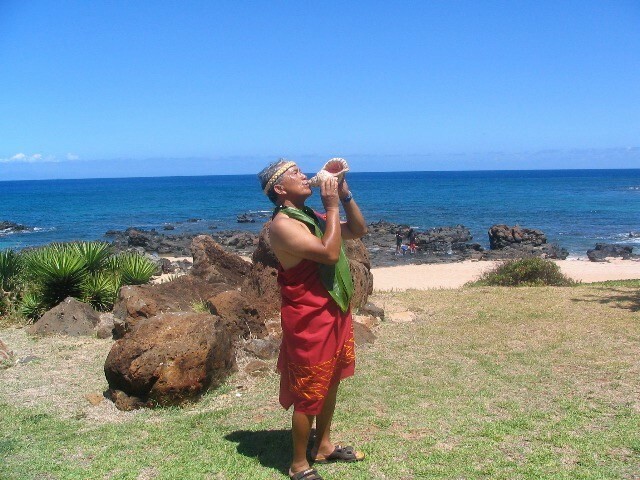 Mahalo nui loa for your review of Dolphin Bay Cottage. It is truly a special place, and I can well imagine a very much enjoyed respite from a cold winter spent indoors. The cottageʻs proximity to Manini Beach and the lanai and seating area out front with the surrounding garden make mornings and evenings a peaceful way to start and end your day. We hope to have you stay with us again. The Dolphin Cottage was an awesome place to stay. The proximity to Manini beach put this lovely little cottage in our category of "best ever". The place was clean, well equipped, quiet, peaceful, friendly... and very conveniently located near a lovely grassy park that had a nice body surfing break and snorkeling entry is what is otherwise a very rocky coast. Thanks very much for opening this spot up for visitors! • One free night for stays of 7 nights or more (excluding Christmas holiday). • No Traveler Service Fees. • Minimum stay 4 – 7 nights depending on season, please inquire. • Reservation will be confirmed upon receipt of 50% deposit. • You must sign our Rental Agreement and agree to the House Rules. • Balance due 60 days prior to arrival. • Refundable Security Deposit $300. • We accept payments via PayPal (no account needed). • 100% refund if cancellation is made 60 days or more prior to arrival. • No refund within 60 days of arrival, however, please contact us to inquire about changing your dates. • The House and Cottage may be rented together or separately. • You may book your stay directly with us. • Dolphin Bay Cottage sleeps a maximum of 2 guests. • We will provide a Pack and Play crib for infants. • Registered guest must be minimum 25 years of age. • No Smoking anywhere on property. Stay In Touch . . . Get Island News and Special Offers.